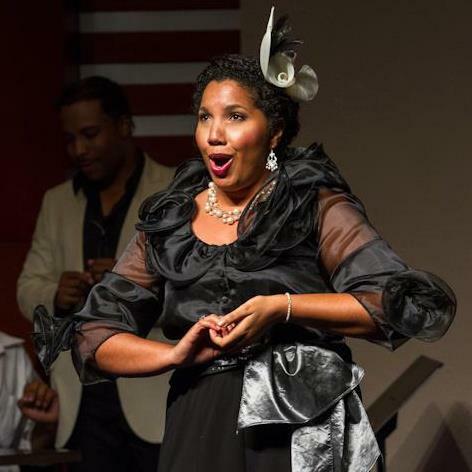 Natalia Dopwell as Madame Hertz - Mozart's "The Impresario"
Operatic soprano Natalia Dopwell has been making quite an impact on the cultural landscape of the Caribbean. 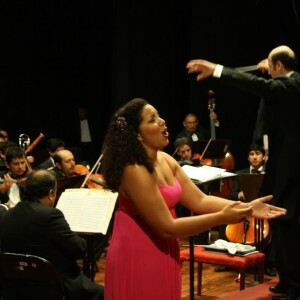 After graduating from the Manhattan School of Music in 2011 with her Bachelors degree in classical voice, she returned to Trinidad and established a ‘Young Artist Collective’ with an aim to guide other young singers in the exploration of the operatic repertoire. Since its inception, the group has performed 4 fully staged operas, building momentum with every performance; Ravel’s “L’enfant et les Sortileges’ (The Child and the Magic Spells) which is based on a children’s story, closely followed by Mozart’s comic opera ‘The Impresario’ which was performed also in Barbados at their annual 100 Voices Project. Their production of Mozart’s ‘The Magic Flute’ proved to be so successful that it ran for a second weekend after the first run of shows entirely sold out, and their latest effort Purcell’s “Dido & Aeneas” was accompanied by the string orchestra of the University of Trinidad and Tobago and led by guest conductor Colin Mendez Morris of Ars Musica, Toronto. Aside from her work with the Young Artist Collective, Natalia also found the time to travel to Peru for the annual vocal festival ‘Concurso y Festival de Canto Lirico’ last year, and was awarded second prize in their ‘Voices of the World’ competition. She recorded her first CD ‘Angeli Musicanti’ which features two other Trinidadian musicians, Alan Cooper on the piano and Juilliard trained violinist Stephanie Matthews. She is also singing on the Calabash Foundation’s newly created music theatre work ‘Jab Molassie’ which is currently being composed by London based Trinidadian composer Dominique Legendre. Past performances around the Caribbean include featuring at the Holders Season in 2006 and a memorable performance with Opera Grenada at the Grand Beach Hotel when they presented ‘A Night at the Opera’ in 2007. During her time in New York City she sang several leading roles in operatic productions, including the title role in Donizetti’s “Rita” with the Martina Arroyo Prelude to Performance program, the ‘Queen of the Night’ in a MSM opera outreach production of Mozart’s “The Magic Flute” and the role of Eurilla in the MSM senior opera production of Handel’s “Il Pastor Fido” for which Opera Magazine noted that “The most advanced were the sopranos;… live wire presence Natalia Dopwell (Eurilla) could wield her diamantine high soprano as Serse’s Atalanta or Alcina’s Morgana”. Natalia is the daughter of Annette and Christopher Dopwell — The family now resides in Trinidad; however they lived for a while in Grenada, where her elder brothers were born.